Since I moved to London, almost 9 years ago, I’ve always wondered how a Christmas cake would taste like. My dear friend Marcus kindly let play around with his family recipe and make my own version of the Cooper traditional cake. 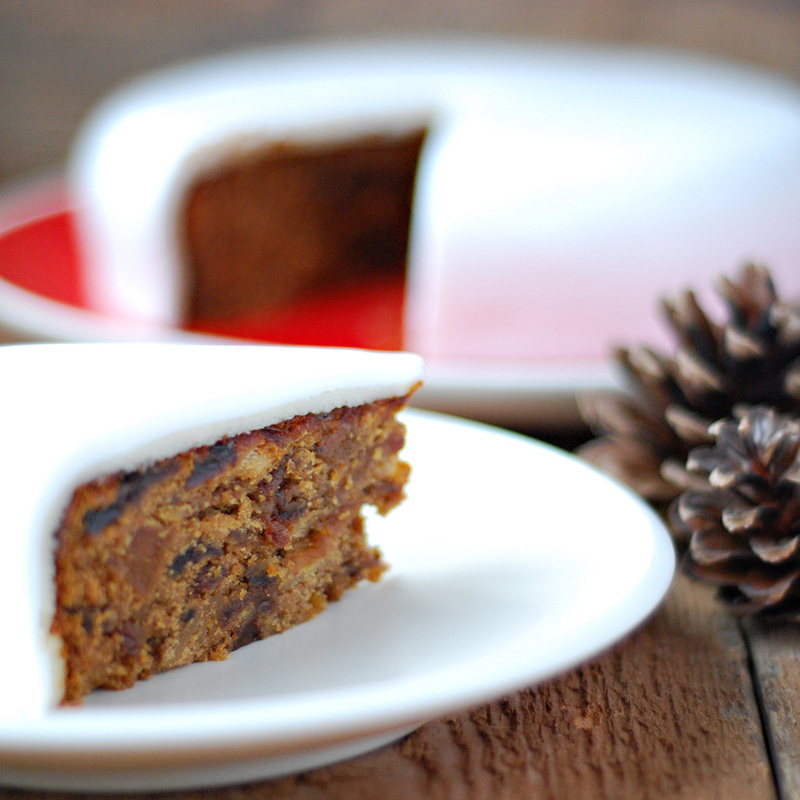 I discovered that I actually really like Christmas cake. It’s fruity, sweet and the perfect accompaniment to tea or coffee. Give it a go and impress your friends over the holidays with this lovely and delicious recipe. Mix fruits, sugar, margarine, water, Sherry and baking soda in a saucepan and bring it to boil. Let it boil for 20 minutes then leave it to cool down to lukewarm temperature. Mix flaxseed with the 3 tbsp water and let it rest for 20 minutes. When the fruits are lukewarm mix together with the rest of the ingredients and bake it on a greased 7 inches tin for 1 hour at 160C. If you want to decorate your cake with marzipan and icing fondant. Spread the apricot jam on top and sides of the cake. Top the marzipan over the cake, making sure it completely cover the sides. Using a very sharp knife, carefully cut around the cake, leaving the leftover marzipan behind. Repeat the process with the icing fondant.